The impressive baroque facade houses is Stockholm‘s Gamla Stan (old town) contains the official residence of the Swedish royal family, although the family actually resides in Drottningholm Palace, a countryside palace on the island Lovön in Lake Mälaren on the outskirts of Stockholm. 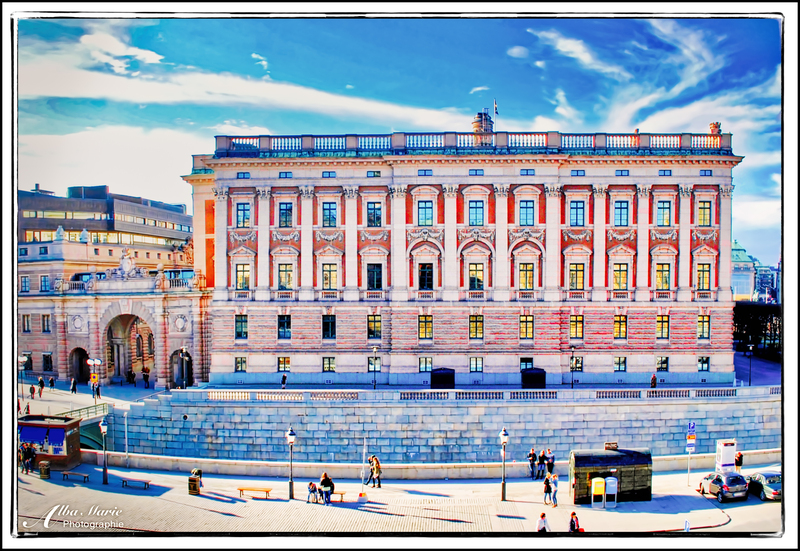 The Swedish Royal Palace has been in the same place on the Gamla Stan since the 13th century, where medieval monarchs built the Tre Kronor Castle, which housed the royal family until May 7th, 1697, when the castle was gutted by fire. War prevented re-construction, and the present castle wasn’t finished until 1754. The exterior of the massive palace has an impressive total of 28 statues, 717 balusters/columns, 242 Ionic volutes topping columns, 972 windows, 31,600 windowpanes and about 7,500 windows, doors and gates. The facade is covered with circa 9,500 m2 of stone and 11,000 m2 of plaster containing an incomprehensible 1,430 rooms – some impressive figures! A castle is bound to have a few skeletons in the closet – two in particular! There is the kindly oracle Grå Gubben (the Old Grey Man) who inhabits the cellars and guards the spirit of the palace. The other is the infamous Vita frun (translating to the imagination-lacking White Lady), who appears just before death. Said to be the Hohehzollern German Duchess Agnes of Merán who killed her family to marry another (predictably, this tactic did not warm the heart of her would-be suitor), and she now haunts the castles connected to the Hohenzollern family. Pro tip: Stockholm Royal Palace is open to the public, with five museums inside its massive interior (price 160SEK). Another day, another bridge. In contrast to the super-sleek, ultra-design Zubri Zuri Bridge in Bilbao, the Pont d’Avignon is one of the world’s most famous traditional, historic bridges – not unlike Prague’s Charles Bridge. The Pont d’Avignon is famous largely because of the classic French nursery song about it (Sur le Pont d’Avignon/On y danse, On y danse/Sur le Pont d’Avignon/On y danse tous en rond) – even though the song is wrong. 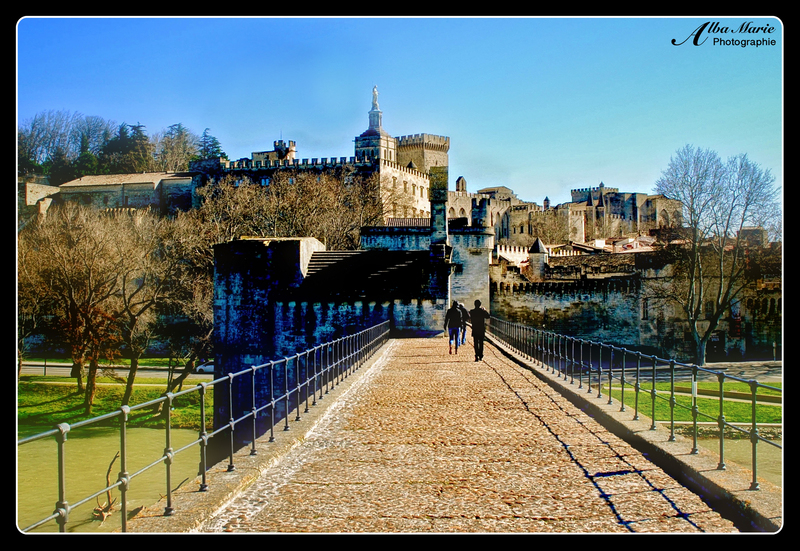 It’s unlikely people ever danced ‘sur’ (on) the bridge; lacking for space, it’s far more likely that they danced underneath…Today the bridge only crosses half the Rhone River, the rest having been washed away (learn more about the Pont d’Avignon’s history here). Rising majestically behind the broken bridge is the Palais des Papes – the Papel Palace – which was the seat of 6 ‘rebel’ popes in the 14th century. During the Avignon Papacy, in 1305 the Palais became the papal residence when French Pope Clement V elected to move the papal centre of authority to Avignon in an effort to avoid facing the chaos in Rome (in all fairness, I’d be inclined to think the same thing…the Eternal City is eternally chaotic). Though succeeding in centralising power and church regulations, the Avignon Papacy also succeeded in consuming most the papacy’s purse by constructing this overwhelmingly extravagant Palais des Papes. Today, this magnificent UNESCO World Heritage Site is one of the largest and most important constructions in the Gothic style in Europe – with its massive halls, extensive dining rooms, glamorous bedrooms and beautiful chapels, it’s easy to why. You can buy a combined ticket in order to visit both sites. For a nice aerial view, climb up the hill Rocher des Domes afterwards. Few places can supersede Vienna for splendour or elegance, and one of reasons for this comes in the shape of the splendid Belvedere Palace. Baroque to the core, the massive estate comprises of the Upper and Lower buildings, the Orangery, the Old Stables, the beautiful jardins francais modelled on Versailles and many intertwining paths amongst the flower beds, marble sculptures, tree-lined paths. In a way, we can thank the Ottoman Empire for this marble monument: the Belvedere was built during a period of renewed construction by the Hapsburg family after the successful end to the encroachment of the Ottoman Empire into Central Europe. Much like the Belevedere, the city of Vienna itself isa work of marble and art: from the soaring grey towers of St Stephen’s Cathedral to the massive Staatsoper opera house, from the seat of power at the Hofburg Palace to the many marble and bronze statues scattered around the broad avenues and finally to the many cafes that have made this city famous. 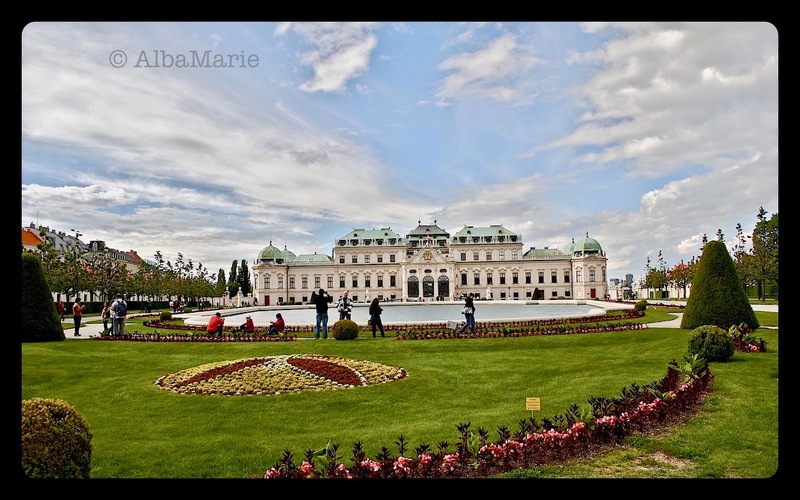 Walking Vienna’s avenues and boulevards and gardens is like visiting a living museum, one dedicated to Baroque and Art Nouveau and Gothic styles. From the historic extravagance of the cafes to the vast grandeur of the palaces, Vienna will make you feel like royalty in another era. Vienna is certainly one of Europe’s grandest cities. Tracing centuries of history along Vienna’s Ringstraße makes one feel awe-inspired and breathless amongst all of the elegant buildings, grand churches, beautiful opera houses and theatres, and never-ending palaces. In fact, it seems as if the city is nothing but palaces! The Hofburg Palace, along with the Belvedere and Schönbrunn makes up the three most famous palaces of Vienna. The Hofburg has housed some of the most powerful people in Europe and it has been in governmental use since 1279. The Palace was the centre of the Habsburg dynasty, (the rulers of the Austro-Hungarian Empire), and from 1438 to 1583 and from 1612 to 1806, it housed the Holy Roman Empire. It continued to be the home of the Emperor of Austria until 1918 and currently serves as the official residence of the Austrian President, Heinz Fischer. Over the years, it has been expanded and re-worked and rebuilt. Bits have been added; other additions have been planned but never came to light. Vienna, lovely and beautiful Vienna, is in so many ways the heart of Europe. It is in almost exactly in the geographical centre of the continent, it has housed many important governments, it has produced, hosted or inspired many of Europe’s important peoples, it is–and has been for some time–one of Europe’s biggest cultural hubs especially when it comes to classical music, and it serves as the gateway between Western and Eastern Europe. 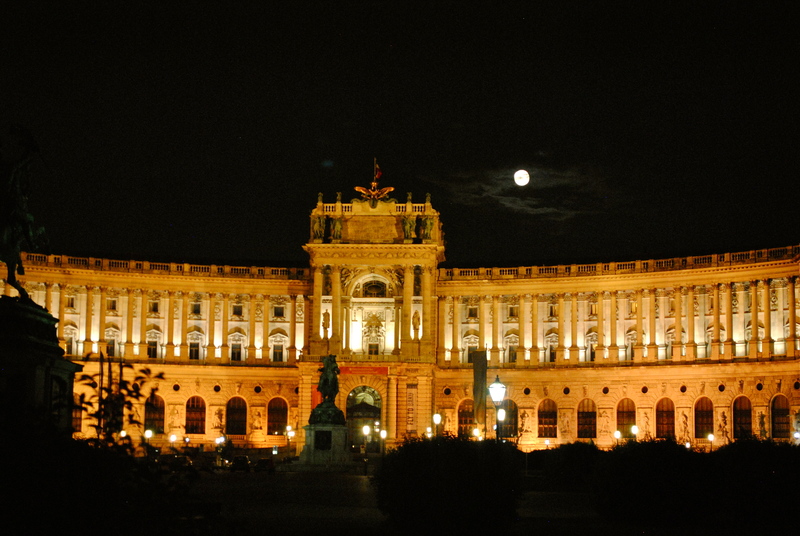 With this beautiful, moonlit Hofburg at its governmental centre, Vienna truly holds Europe’s vibrant, beating heart. Ah, Belvedere. 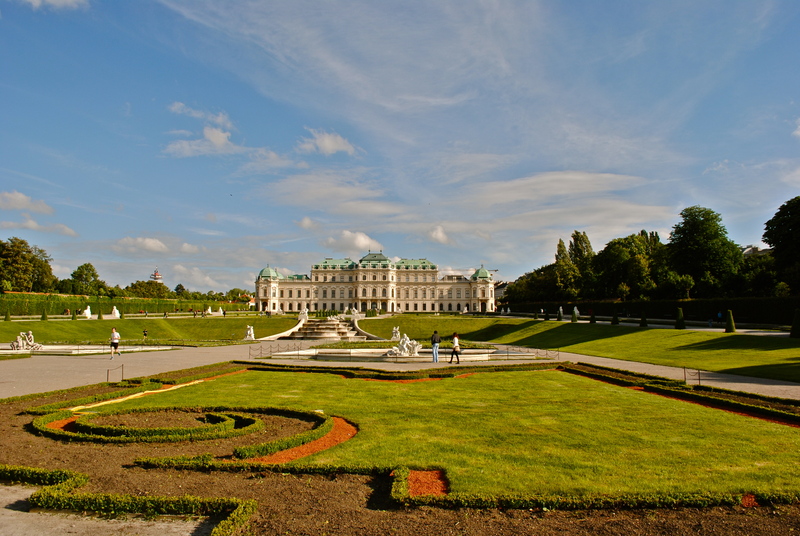 What would a trip to Vienna be without a promenade around these beautiful gardens? Comprised of two main complexes, the Upper and the Lower, the area also includes a few very lovely gardens. The area surrounding the palace is neatly manicured (in the French style) while the other is far more wild and natural. The oldest sections of the Baroque palace, which date back to 1717 (completed 1723), was built for Prince Eugene who, like all monarchs, wanted a nice, cozy place to relax outside of his taxing duties of being a prince. Various important people have entered these doors , including Franz Ferdinand, Marie Antoinette’s daughter Marie Thérèse Charlotte, and Maria Theresa, though she never lived here. Instead, she decided it would make a nice place to store the Imperial family’s art collection. After the first world war, the Palace officially became a museum, and was eventually opened to the public. Most people go here to visit a particular piece, Gustav Klimt’s The Kiss. Even though the piece is surely worth your attention, don’t miss the rest of the exhibits, or the architecture, and especially not the gardens–because it is the whole experience that will make your visit special!